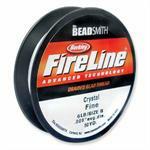 Step 1: String onto 2 feet of Fireline thread 5 Super Duos and 5 size 11/0 seed beads, alternating between the two. 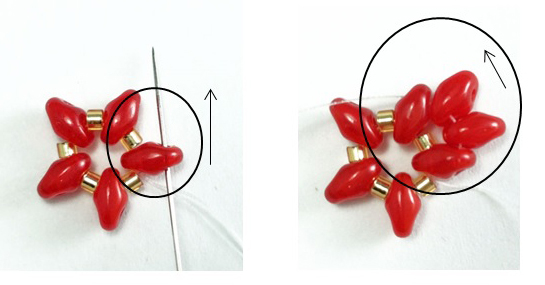 Tie your beads together to form a circle and pull your needle through the top hole of the adjacent SD. Thread on 2 SDs and pull your needle through the top hole of the next SD. Repeat all the way around. Step 2: Pull your needle through the top hole of the SD your thread is coming out of. String on one 4x3mm crystal rondelle and pull your needle through the top hole of the next SD. String on 1 SD and pull your needle through the top hole of the next SD. Repeat all the way around alternating between the 4x3mm crystals and the SDs. Step 3: Add a loop at the top of your Poinsettia, add an earwire and repeat for the second earring. 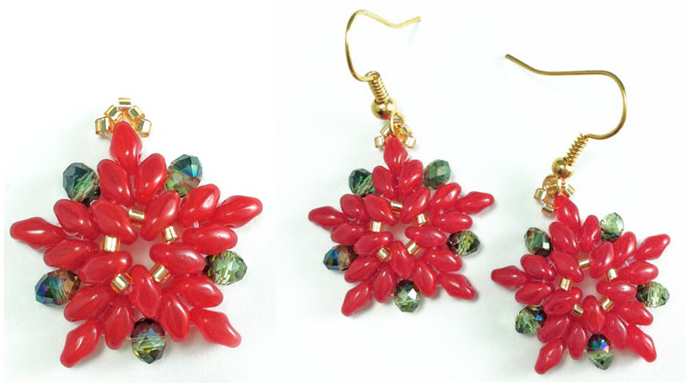 Viola, your finished Poinsettia earrings! Step 4: Send us a photo of your earring project via email. We'd love to see your take on our projects. Happy creating! The tube measures 4 inches long and weighs 11.5 grams (including the tube).